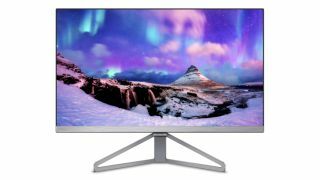 Phillips has revealed a new 24-inch monitor in its Moda series, aimed at both entertainment and productivity usage, which is the thinnest ever model the company has produced – at 5.2mm – plus it benefits from vanishingly slim bezels. The Philips 245C7QJSB actually has bezels on three sides which are ‘frameless’ – i.e. close to being invisible at 2.5mm – with a thicker bezel on the bottom edge. This obviously gives a very slick appearance, and means if you put more than one of these displays next to each other, the effect will be practically seamless from screen-to-screen. As for the core specs, this is an IPS panel with a Full HD resolution (1920 x 1080) and a refresh rate of 60Hz, response time of 5ms, with a brightness of 250 cd/m2. It also has ‘Ultra Wide Color Technology’ on-board which promises vivid colors, and of course the fact that it’s IPS means great viewing angles. On the eye-care front, the monitor has flicker-free tech (which is increasingly becoming standard on any display), and also SmartContrast and SmartImage features which intelligently adjust image settings to be appropriate for whatever content is being displayed. Those sort of systems can be a little hit or miss, mind, but you can always turn the options off if you prefer. Ports include a legacy VGA connector, alongside DisplayPort 1.2 and an HDMI port. The stand isn’t height-adjustable, but does offer tilt of between -5 degrees and 20 degrees. The Philips 245C7QJSB will go on sale this month, and won’t break the bank priced at £189 (around $235, AU$310).